XLR CablesXLR studio cables can reduce noise and improve the overall quality of your sound. Your monitors will sound 'tight', your bass smoother and a cleaner and balanced signal will be produced. 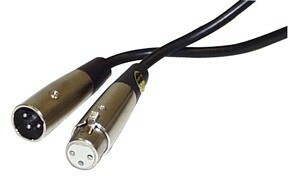 Use XLR cables for the cabling between your amplifier and pair of monitors. Also try to have balanced XLR cabling anywhere you can between your studio mixer and audio output devices. Remember that a signal path needs to be as clean as possible for your music to sound crisp and noise levels kept to a minimum.